Who was that rather reluctant American troubadour on the stage of the Floral Hall in Hornsea some time in 1971? Hornsea, halfway down Bridlington Bay on the east coast of Yorkshire. Little more than a large village that once perhaps had pretensions of becoming a seaside resort to rival Scarborough further up the coast. Inside that North Sea-beaten Floral Hall between the ages of fifteen and eighteen I met my first girlfriends, had a fight that stilled the dance floor, began my one and only LSD trip, shared tales, downed copious amounts of beer and enjoyed some great live music including UFO, Mott the Hoople, Roxy Music and a sad-looking thirty year old from Oregon called Tim Hardin. Tim Hardin...You don't hear the name much these days. He was born in Eugene in 1941, entered the US marines in 1959 and was subsequently posted to Vietnam where, as well as being a "military advisor", he apparently discovered heroin. Back in the USA he became part of the Greenwich Village scene but somehow never really fitted in. He was on the edge of things but later found a place on the main stage bill at Woodstock in 1969. 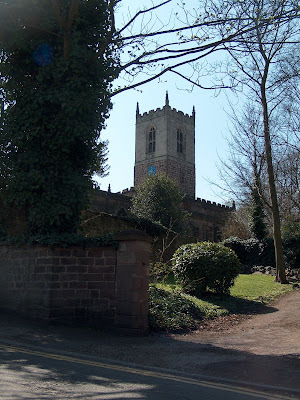 In his last ten years, he was often over here in England, eking out a living from folk club appearances and mini-concerts such as the one I witnessed in Hornsea all those years ago. But between appearances he was wrestling with a lonely heroin addiction that ultimately meant he only lived half a life, dying in December 1980. On his simple memorial stone at the Twin Oaks cemetery in Oregon - these true words are inscribed - "He sang from the heart". Tim Hardin was a talented songwriter who never really followed the crowd. He was his own man. Some songwriters leave little behind as the tide of time washes over their achievements but high up the shingle on Hornsea beach Tim Hardin has left at least two songs that endure - "If I Were A Carpenter" and this one... "Reason to Believe", once memorably re-interpreted by Rod Stewart but covered by several other bigtime artistes. Thank you Tim for at least leaving us this song. Last week I was imprisoned by Mrs Pudding. She insisted that I practised my decorating skills upon our front room - the lounge. Good grief! It was last decorated as recently as 2003. You could still smell the drying paint. Many hours later, the picture rail and skirting boards are satin white, the ceiling is baby white and the walls are ivory. Naturally, I made good use of my favourite DIY product - decorator's caulk - to fill in those irritating little cracks and holes - in my quest to produce a professional finish. Mrs Pudding was not disappointed and as a reward, allowed me to visit the local pub for half a pint of Tetley's bitter and a salted peanut. As time goes by, it becomes clear that in every single country where the Roman Catholic church has a major foothold there has been sexual abuse of children by priests. These are men who are supposed to have committed their lives to God and all that goes with Christian mythology - meekness, loving one's neighbour, obeying a Christian moral code that extends way beyond the ten commandments. I feel extremely sorry for all those thousands of priests who have lived blameless lives, serving their religion and their congregations with selflessness, humility and exemplary moral standards for they are now tainted by their peers' cruel exploitation of vulnerable kids over very many years. There are bad men in the world - paedophiles, rapists, men who are out to gratify themselves with little thought for their victims. We know this. And we might expect such men to appear in different guises - lecherous taxi drivers, raincoated stalkers, egoistic businessmen in flash cars but you wouldn't have expected so many of these bad men to appear in the garb of priests - Men of God. I can hardly imagine what it must be like to be haunted by memories of sexual abuse. To grow up with feelings of self-loathing, guilt, overwhelming anger and mental confusion. The scars will be deep and long-lasting. I don't suppose you ever truly get over something like that. 1) How much longer will the Italian government collude with the Catholic church in Italy to cover up that country's legacy of abuse by priests? 2) Yes, children have been sexually abused but what about adults? Grown up Catholics - both men and women - have been vulnerable to abuse and exploitation by priests. Will vigorous investigators ever explore this avenue? 3) Sexual abuse is horrifying but there are other forms of abuse that should invite proper review - physical abuse and systematic humiliation for example. Tales of despotic Christian Brothers and cruel nuns are legendary in Catholic schools and other institutions. Just because such abuse wasn't sexual doesn't mean we should wave it by as if it were ultimately tolerable. 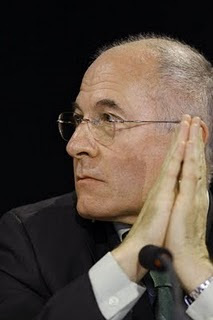 4) Shouldn't the Catholic church ditch the requirement that priests should live pious, celibate lives? Why can't they marry or take partners? Very obviously, existing regulations have helped to provide a fertile climate for sexual predation by priests. 5) Why would anyone continue subscribing to a religion that has provided a previously impenetrable veil behind which such terrible things have happened? A church should be a place of peace, comfort, refreshment, enlightenment - not a place of perversion, wandering hands, evil collusion. 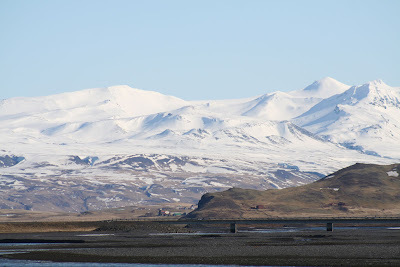 What does the almost unpronounceable Icelandic name Eyjafjallajokull mean? It is geographically functional and simply means Island-Mountains-Glacier. It lies above coastal mountains that overlook some offshore islands. It is dwarfed by another volcano called Katla (Dragon) whose crater is approximately six miles in diameter. Yes - six miles! I was lucky enough to visit Iceland in 1991 and saw Eyjafjallajokull with my own eyes as I travelled round that unique country. 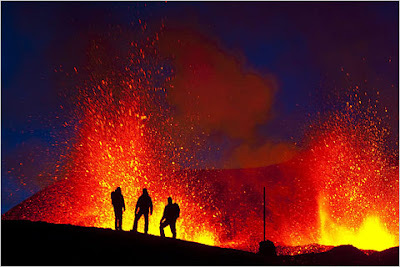 It is sometimes known as "The Land of Ice and Fire" and I vividly recall a day trip to Viti (Hell) which is another volcano in the north of the island with a vast lake in its sleeping crater. That day in June, a blizzard was blowing snow horizontally as I picked my way across a field of bubbling sulphurous mud pools - like boils bursting out of the planet's troubled core. 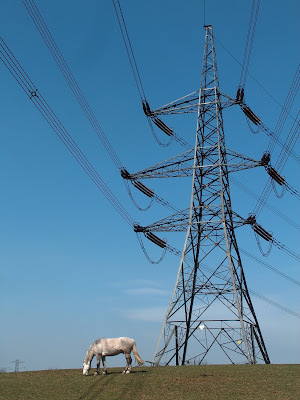 It was at once enervating and unsettling - to be in the presence of such fundamental forces. In the centre of the island, it felt as if I was travelling across the surface of the moon - vast lava fields coloured pathetically by tundra lichen. With a guide and half a dozen other visitors, I came to an escarpment that ranged from the northern horizon to the south. Here you could see very clearly where two continental plates are ripping themselves apart - the Mid-Atlantic Ridge. We crept into a huge cavern under that escarpment and saw a lake of steaming hot water. 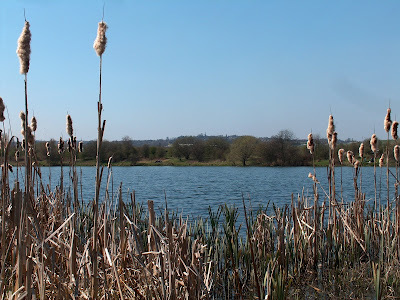 I remember the guide telling us that when he was a boy he used to swim in this lake but by 1991 swimming would have been impossible - boiling vegetables would have been easy. European aviation authorities have revised their attitude to Eyjafjallajokull's belching of volcanic dust. All of a sudden, caution has been thrown to the wind and aeroplanes may fly following a week of cancellations. Money has spoken. But if we see just one death, one aeroplane brought down then those authorities will have hell to pay. Historically, when Eyjafjallajokull grumbles, Katla roars a short while later. This would be like jumping on a chair because a mouse is on the loose, only to discover that a herd of wilderbeest are preparing to thunder through the neighbourhood. We arrogant human beings with our certainties and and our logic sometime imagine that we are masters of this planet as we plunder the forests and the oceans, destroy other creatures, dig minerals from the crust, dam rivers, build skyscrapers, jabber on TV screens - but we are not masters - we are servants, serfs, simpletons. 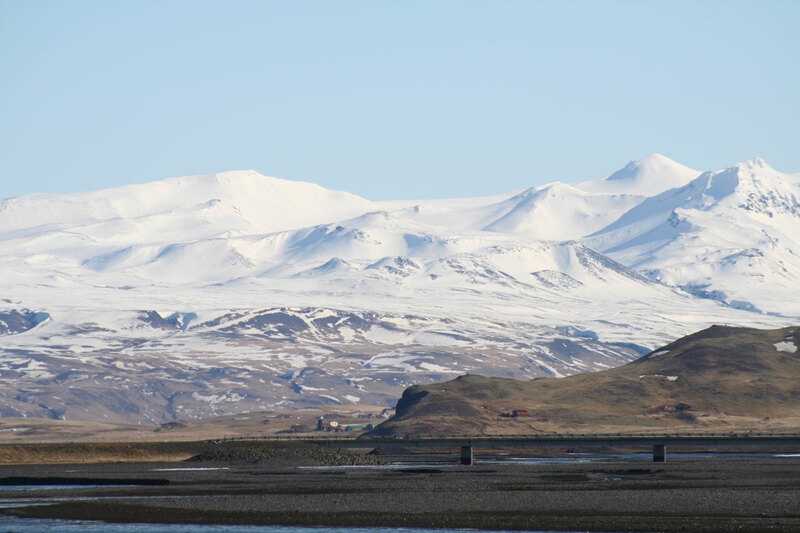 Eyjafjallajokull reminds us that Nature with its elemental forces is the true Master of the Universe. Theirs was a love that defied international boundaries. He was a Cambridge graduate who dabbled in Conservative politics. She was a flamenco dancer from the peasant flavellas of Valladolid. One steamy night in Benidorm, she entranced him, her heels clicking to the plaintive strumming of a Spanish guitar. She said her name was Miriam. He said he was called Nick and that he was sunburnt. Just below the "Lord Nelson" beach bar, their bottles of "San Miguel" clinked under a sultry Mediterranean moon. He said his mother was Dutch and that his father was half-Russian. She said she was falling in love. A veritable Casanova with thirty notches on his John Lewis reversible belt, Nick whispered huskily, "We shall have babies Miriam... three boys and we will give them solid English names as would befit a future prime minister. 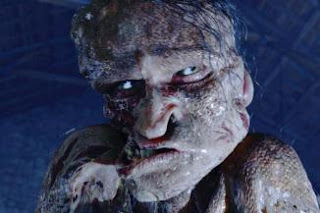 Arthur Clegg after our mythical king. William Clegg after my liberal hero - William Ewart Gladstone. And Jeremy Clegg after the great Paxman of the BBC!" "No effing way!" screeched Miriam. "We will name them after the fiercest captains of the Spanish Armada - Antonio, Alberto and Miguel!" "But my little Iberian paella. Those names will not sound right if followed by the solid English surname Clegg... 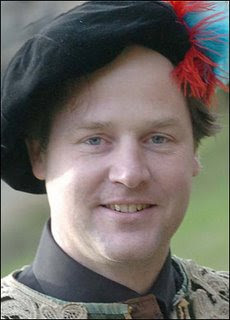 I mean Alberto Clegg? It sounds like a stand up comedian!" 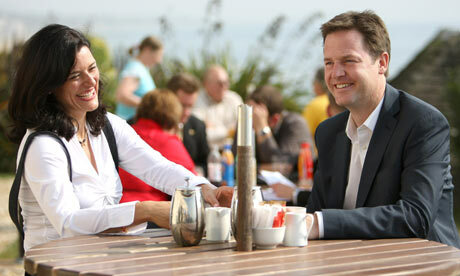 "Well senor unctuous academic with only five years as an MP behind you," leered Miriam. "You either accept my name choices or I'll be making a play for Uncle Vince Cable, the noxioius Labour renegade." Unable to press his point home, Nick quickly caved in. They were married the following springtime - he in medieval garb and she in a flame red flamenco frock with white spots and puffed sleeves. Instead of "The Wedding March", a David Bowie number was played - "All The Young Dudes" and guests included the investigative broadcaster Louis Theroux who remembered his 80's USA road trip with Mr Clegg when the aspiring politician would sometimes disappear for hours on end for sessions of transcendental meditation. Quite unusual for "Rodeway Inn" guests and often a nasty surprise for Puerto Rican room cleaners. If you want to look like this! Occasionally, I find myself being cruelly ribbed by a gentleman who lives in Georgia, USA. He is an urbane and erudite blogger of mature years. His blog is titled "Rhymes With Plague" because I imagine that on many occasions he has used this remark to clarify the spelling of his surname. He is Robert H Brague who last year won my coveted "American Blogger of The Year" award. Very recently he posted a YouTube clip of an ancient Londoner singing along to his ukulele and declared that this was me! I can assure you it was not. Furthermore, he implied that my saintly daughter was only "pretending" to study in Birmingham, Alabama where in fact she has been working like a coalminer at the face of knowledge - demonstrating to the lazy burger-munching Yankee extras from "Grease" what it means to be a proper student. So who is my tormentor - this Robert H Brague? The only picture we see of him in his blog is of when he was a small child - shortly after photography was invented. I decided to do a little investigation via an obscure and little-known search engine called "Google". I clicked on "Images" and then carefully typed in Robert H Brague expecting to see several pictures of the old rogue but the results were confusing. Is this him? 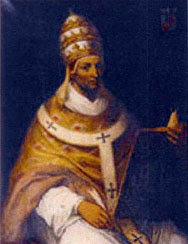 No, it's Pope Johannes XXII....So was this him? No it's a writer and intellectual called Remi Brague so it couldn't possibly be the man I was after. The letterbox rattles. Something drops to the mat. What could it be? An evocative postcard from faraway? One of those nice envelopes from "ERNIE" that tell you you have won £50 on the Premium Bonds? 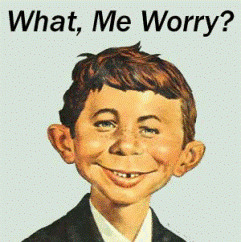 Or perhaps one of those regular official letters you have to deal with - car insurance up for renewal, water rates break down for the year, "Student Finance England"? No my friend - none of these - it's yet another mailing from a food takeaway establishment somewhere in the darkest depths of this city. Recently, it's been happening almost every day. It's as if some machiavellian expert in psychological torture is sitting in a high rise turret planning my downfall by sending out menu after menu, mailing after mailing - expecting my blood pressure to rise to bursting point. How many more times do I have to trot out to our paper recycling bin with these things? And in a world where we should all be striving to cherish the planet's natural resources why should we be bombarded by these unwanted pieces of folded shiny paper? It's such a waste. Then you turn to the content of the damned things. I mean, who in their right mind would want to buy this "family meal" for £13.95 - "Any 2 x 12inch pizzas, any 12inch garlic bread, a portion of coleslaw, a large portion of chips, a large bottle of fizzy drink" ? Can you imagine? "Children! It's dinner time. Come and get it!" In my humble opinion, anyone providing their families with such crap should be arrested and charge with cruelty. For £13.95 you could prepare a truly delicious and nutritionally worthy meal from scratch using fresh ingredients and still have change for a nice bottle of wine. Regarding pizzas, I have never seen the point of them. Lumps of flabby dough with gunge smeared on them. Doner kebabs are a well-known health hazard. Those huge meaty cones that turn for weeks on end maximising the salmonella bug count. As well as announcing the "express" delivery service, leaflets should provide directions to the closest Accident and Emergency facility! I'm planning to form an urban retaliation group. 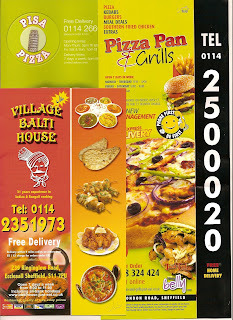 We will inundate all the takeaway establishments of Sheffield with our own irritating leaflets about nutrition, food poisoning and legal services for failing takeaway businesses so desperate to stay afloat in a time of economic recession that they think it is perfectly acceptable to invade our homes with "Mega Deals", "Sunday Specials", "10% Student Discount", "Tubs of Chilli or Garlic Mayo", "Potato Wedges" and "Mediterranean Delight" pizzas. It's time to fight back before we are all suffocated under vast piles of takeaway mailings. Recently, I have enjoyed many interesting posts in this cyberworld which has become a fascinating adjunct to our daily lives. 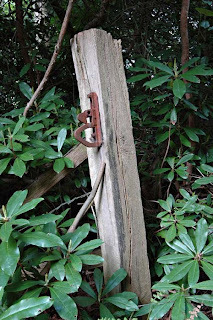 It is always nice to come across a good post - especially a gatepost! Above - a country post under attack by triffids. It may need editing or postponing. Below - Noble Victorian gatepost at the entrance to a Birmingham (UK) park. Quite a substantial post. 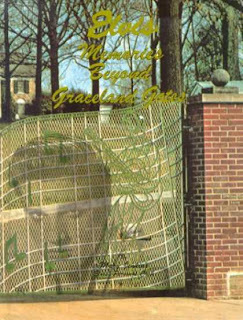 Below right Gatepost at the entrance to Elvis Presley's Gracelands mansion in Memphis, Tennessee - recently visited by Miss Frances Pudding, daughter of the nutcase making this silly post about posts. It was erected postwar. Posthumously, Elvis left the mansion to his family. Below Post box. No posters allowed. Below The Last Post... played by a Mr J.Naylor who posed for the camera in Laughton churchyard, Lincolnshire. He was once posted to Cyprus though it was supposed to be Malta. Allegedly, the city of Valencia is home to some 810,000 souls with over a million and a half in the greater metropolitan area. But it never felt that way to us. The downtown area was curiously sedate and when we arrived last Tuesday, we even guessed that the country was enjoying a public holiday. It wasn't. 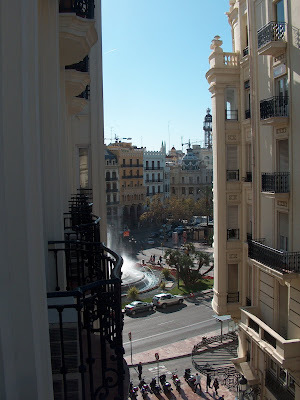 Our hotel overlooked one of the city's main hubs - the Plaza del Ayuntamiento. Although only a two star establishment, our fourth floor room was both clean and equipped to a good modern standard. There was even a little private balcony above the side street next to the hotel. Breakfast was included with the room charge and it was okay - spanish omelette, frankfurters, cheese slices, ham, tuna fish, fresh fruit salad, croissants, fresh coffee and bread. My only gripe was that guests were expected to pay an extra euro for a glass of fresh orange juice. I have never come across such an irritating supplementary charge before. 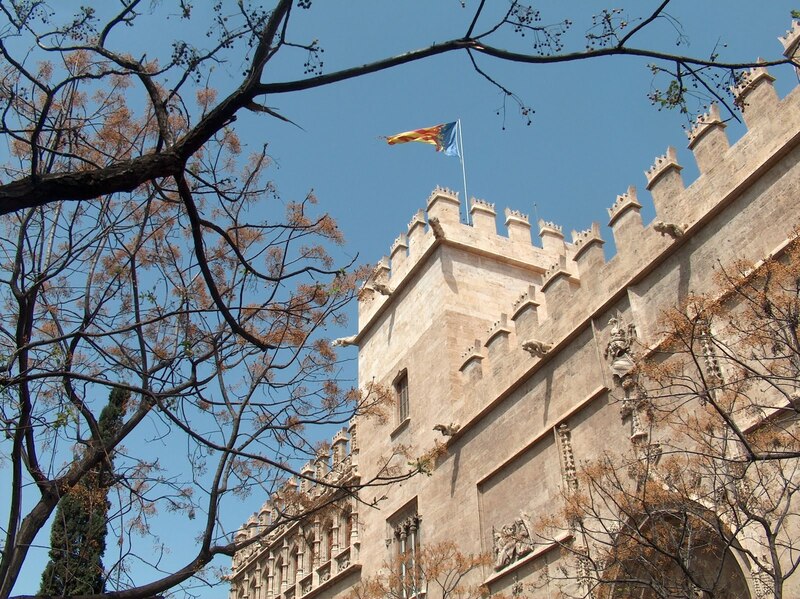 Established by occupying Romans in 137BC, Valencia has experienced a long and colourful history. This is reflected in its old town architecture which evidences various cultural influences as well as the city's economic might in past centuries. Previously, the north and eastern flanks of the original walled city were protected by the Turia River which had different moods and was crossed by several stalwart stone bridges. Ruinous flooding in 1957 led the city fathers to make a daring decision to divert the river's course. Where once zillions of gallons of water danced to the sea, the old riverbed is now home to luxuriant gardens, jogging tracks, football pitches, children's playgrounds and the breathtaking architecture of the futuristic City of Arts and Sciences complex conceived by the innovative Valencian architect - Santiago Calatrava. While we were there we visited three museums. There was the Gonzalo Marti National Ceramics Museum housed in a beautiful old Renaissance palace. It showcased the finest ceramics commissioned by the city's ruling aristocracy but seemed oblivious to the everyday ceramic-ware of the ordinary working classes. 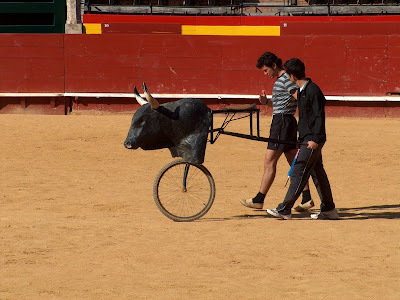 A second museum visit was to the Plaza de Toros - the bullfighting museum next to the city's Colosseum-like bullring. The third museum involved a metro ride to the northern suburbs. 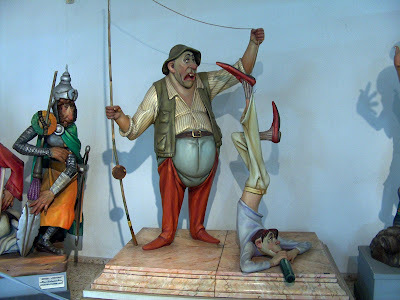 It is called the Museo Fallero and it celebrates the city's Fallas Festivals. "What?" I hear you asking. Each March, huge papier mache statues or scenes adorn various streets and plazas. Over the years they have become ever bolder, ever more professionally finished. Unfortunately, on the night of March 17th or 18th each year the Fallas figures are burnt in a carnival atmosphere with dancing, wild singing and firecrackers bursting. The museum houses many "ninots" or models of those vast sculptures and tells the story of this unique tradition. It used to be that British people saw Spain as a bargain basement holiday location with cheap accommodation and low-priced drinks and meals, making holiday pounds stretch further. Not any more - I can tell you. On the Thursday night, we visited an unexceptional city centre bar to watch, on TV, Atletico Madrid play Valencia in the Europa Cup and were charged nine euros for two beers - that's over eight pounds. 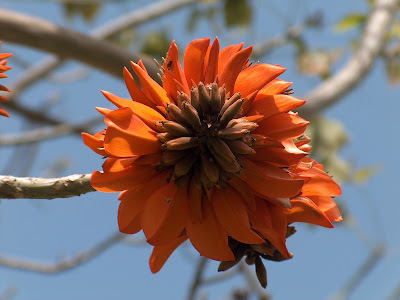 The city's lovely botanical gardens were much better value at only a euro each and we passed two happy hours there amidst various exotic palms and spectacular cacti. City breaks like this can often involve a great deal of walking and should you choose to visit Valencia, Rome, Berlin or any other inviting European city may I humbly suggest a stout and comfortable pair of walking shoes or, if wheelchair-bound, an Olympic athlete to push you round. 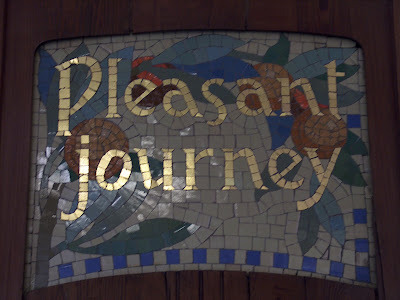 I could go on and on boring you to death with more intricate details of our mini-adventure but I sense it's time to plant the following full stop. "NO FOTOS!" at the Fallas Museum but I took this one anyway. VALENCIA - Not sure what this vibrant spring bloom was. Any ideas? Seen on a tree in the Turia Gardens. Following extensive flooding in 1957, Valencians audaciously changed the course of their ancient River Turia. Nowadays, the former river bed provides green parkland which embraces the old city. 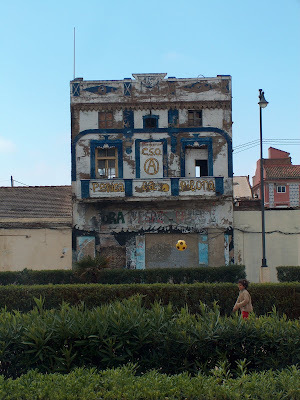 Anarchists' former squat near the beach with a child bouncing a plastic football between the hedges. Mosaic spotted in the magnificent old railway station. Lovers using each other as pillows in the Turia Gardens. 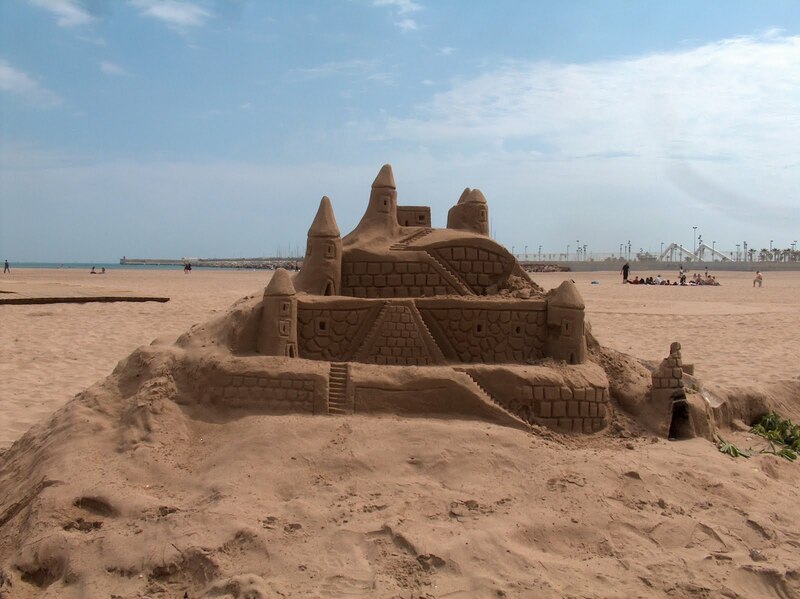 Sandcastle on Malvarossa Beach - a short tram ride from the city centre. In the bowl of the Valencian bullring, a trainee matador discusses tactics with his trainer. La Lonja de la Seda - one of Valencia's most imposing buildings. It was an important silk exchange and the cradle of much of the city's prosperity in the fifteenth and sixteenth centuries. View from our hotel room balcony in the centre of the city - towards the Plaza del Ayuntamiento. 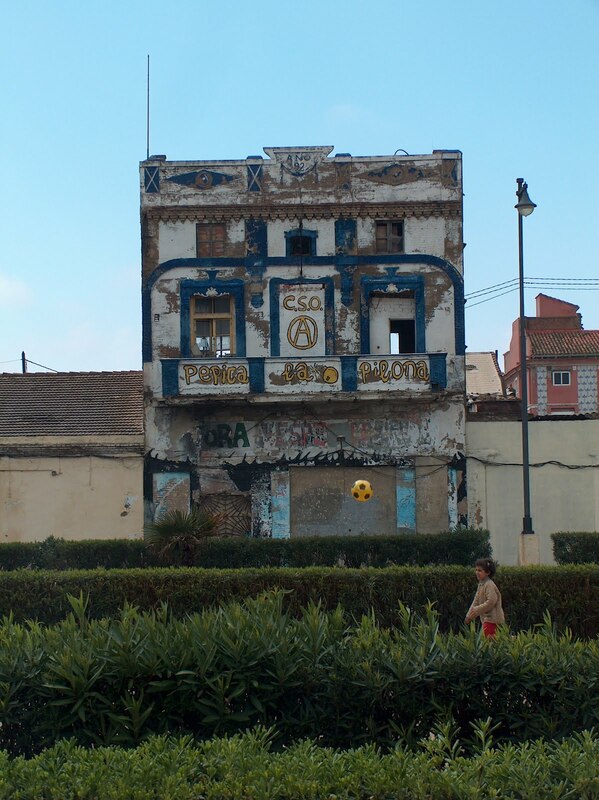 Valencia isn't a city that just looks back on past glories. 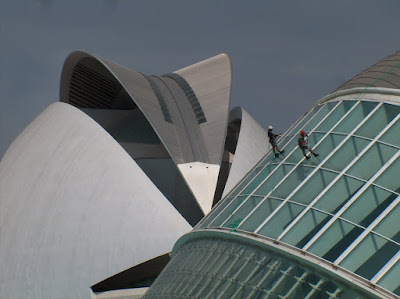 Here in the City of Arts and Sciences some of the architecture is quite stunning. The building in the background is clad in tiny pieces of broken off-white tiles. 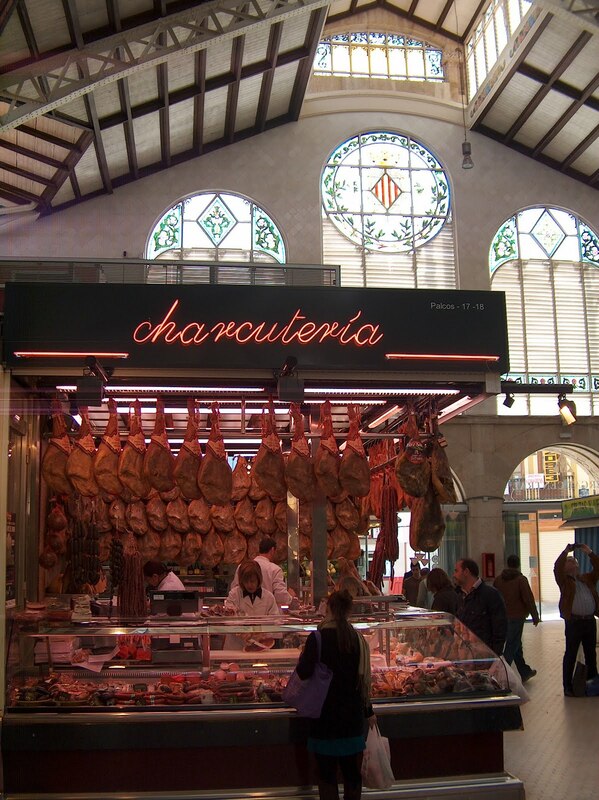 Valencia is Spain's third city. We will be there by lunchtime tomorrow, making our way by metro to the Hostal Venecia on the edge of the city's oldest quarter. After "The Panic of the Lost Passport" we then moved on to the next episode of our living soap opera -"Will Our Carry On Cases Measure Up?" We're flying down to Spain with Ryanair - Britain's most successful budget airline. I guess I first travelled with them ten years ago, taking advantage of rock bottom deals to Norway, The Czech Republic, Sardinia, Porto, Berlin, Marrakech and so on. I am grateful that Ryanair provided me with such a golden opportunity to make a carbon footprint as deep as the Cheddar Gorge because they also allowed me to visit places I would have otherwise missed. However, over the years the airline has altered and many air passengers have grown to despise Ryanair for their pettiness and trickery in squeezing extra payments from passengers they should be cherishing. The latest scam concerns carry on luggage. A lot of Ryanair passengers try to avoid presenting hold luggage because each bag adds another £30 to the overall cost of travel. Instead, many passengers walk on Ryanair planes with small cabin cases which are then squeezed into overhead lockers. The company have become very stringent about the dimensions of carry on bags. They must be no more than 55cm x 40cm x 20cm - including straps, handles and wheels. At several airports, Ryanair have been using a high-tech testing device - namely a cardboard box that will fit over cabin bags that comply with their regulations. Owners of cabin bags that fail the cardboard box test have to pay up £35 on the spot to have their carry on bag transferred to the hold of the aircraft. You're not allowed any extra carry-on items - no cameras, ladies' handbags, duty free purchases etc.. Everything must be in your carry on bag. This is why, earlier today, Shirley and I went to our local TJHughes store armed with a tape measure to buy a new carry-on bag, knowing that one of our old cabin cases was a centimetre and a half too tall. Assuming that we survive the Ryanair stormtroopers and their vindictive regime, we hope to have a nice break in Valencian sunshine. Of course, I'll let you know what we saw and how things went after we return on Friday. And if you're thinking of burgling our house while we are away - forget it! As usual, lethal booby traps will be activated all over the house. You wouldn't want to fry would you? Above Robert Harrison prepares one of his balloons. Below the amateurish payload construction. 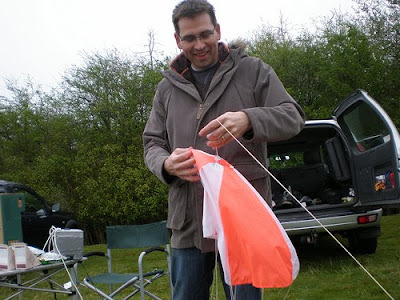 Hobbyist Robert Harrison is of course a Yorkshireman. At the age of thirty eight, he lives on the outskirts of Highburton near Huddersfield with his wife and three children. He is an IT director but in his spare time loves messing about with balloons, cameras and suchlike - linked with which he has also spent a lot of time educating himself and making useful links via the internet. 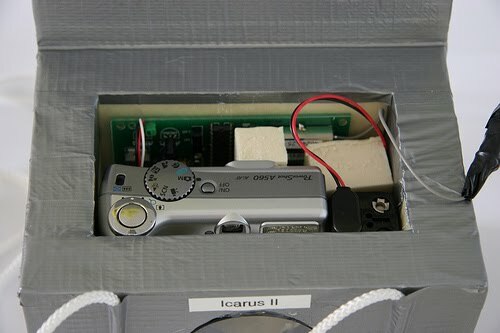 Gradually, something called the Icarus Project developed - a bunch of amateur weather balloon and aerial photo enthusiasts led by Robert himself. I checked out his Flikr photostream which not only illustrates the amazing results of his little hobby but also wedding and family photos. This is a real amateur we are talking about. 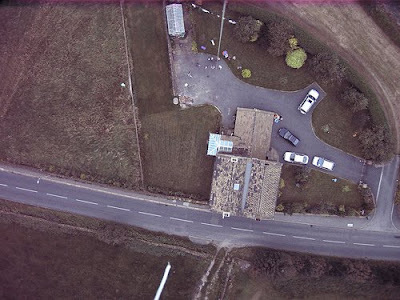 For round about £500, he recently sent a camera up into the sky after first checking jet stream activity and informing local air traffic controllers. 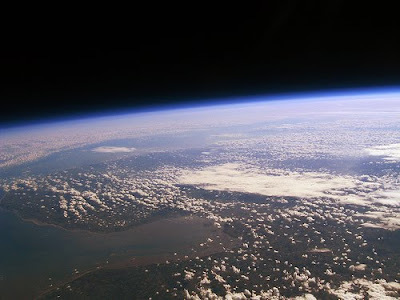 The semi-inflated balloon with its Heath Robinsonesque payload went up and up and up to 35,000 metres above this planet's surface, to the very edge of outer space, all the time snapping pictures of the Earth below. Aided by his mother as driver, Robert was able to track his balloon when it parachuted down three or four hours after the launch. It was tangled up in some trees. Later, sitting in a pub with his laptop he was able to marvel at the results of his most recent launch. "Ooo you are a clever lad Robert!" beamed his mother. A couple of weeks later, "The Huddersfield Examiner" got hold of the story and it wasn't long before the world's media were pursuing this good news tale. NASA were also inquisitive and contacted Robert to see how he'd managed such amazing results for under £500. They spent several millions more to achieve similar success. You see, if NASA was run by Yorkshiremen, we'd have astronauts on Mars and still have change for a portion of cod and chips. Well done Robert! Yorkshire is proud of you. 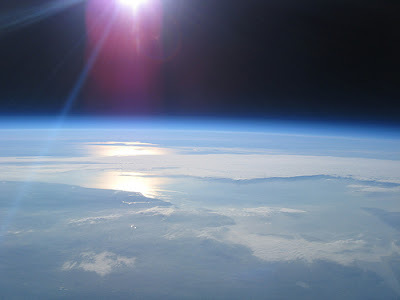 Above - the contraption is at 35,000 metres, on the edge of space. Below - Robert's favourite photo - showing The Wash on England's east coast. 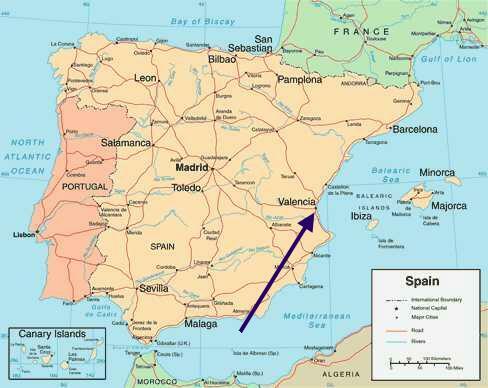 We have booked flights to Valencia in Spain plus a budget hotel in the Plaza del Ayuntamiento. All very well and good until this afternoon when I thought I would check in on-line... Flight reference number - fine. Name, date of birth - etched in my brain. Identity document? Passport of course. Now passport number... okay no problem. Unlike some disorganised dimbos, we have a document drawer in which we keep all things related to travel, including passports. I get up from the grey swivel chair I am sitting on right now and mosey into the dining room. The little tomato plants under our french doors are bending to the light and the seed potatoes are at last starting to stir from their slumber. I scan down the little drawer labels - Pay, House, Bank and yes - that's the one - Travel. Whose passport is this? Ah yes - Shirley's. She recently had it renewed. And this one must be mine...but it's not - it's an expired passport with a front corner clipped off. I lift out the drawer, lift out everything, root around. At this moment, if I were a cartoon character, a big thought bubble would appear above my head with a giant question mark in it. Jumpin' Jehozafat! Where's my friggin' passport?! For the next two hours, Shirley and I are like demented members of the South Yorkshire Police drug squad on a thorough search of our house. We rifle through drawers and papers. We're in the kitchen. We're under the coffee table and I'm up in the attic checking out the suitcase I took to South America last autumn. Oh woe is me! Where can it be? I phone up the passport office in Liverpool, already visualising a mad dash over the Pennines for an emergency issue but the Irish guy at the end of the line tells me that their costly one day service is only available for passport renewals, not for lost passports. Holy smoke! And drat and double drat! Tomorrow we'll search our upstairs rooms with a fine tooth comb. I'll need an angled mirror for the lavatory U-bend and perhaps a passport sniffer dog. As I prepare our evening meal - a traditional English chicken dopiaza with basmati rice, sag aloo and nan bread - I am reliving the last few months and wondering how the passport vanished. Who crept into our house and stole it? It's while we are munching our vittles in full view of the tomato babies that I have a sudden brainwave. On a little shelf near our bed is a plastic wallet folder with various documents and leaflets from my autumn trip. I bound upstairs like a gazelle and sure enough, hidden among the papers, inside a brochure about a Chilean football team - Universitad Catolica - I find the treasured passport. Praise the Lord! Praise him I say! Twas lost but is found again. Panic over. I spoon prune yoghurt into my mush while enjoying the latest episode of "EastEnders". Will Jack die? Won't he? Later I check in on-line. My pulse is no longer galloping like a thoroughbred on an Irish strand. Watch out Valencia! We're comin' to see ya after all! Yaaay! You must have heard the news by now. Don't you think it is disgraceful? 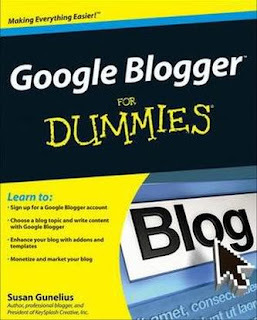 I mean, for at least seven years bloggers could post blogposts for free and leave as many comments as they wished on other people's blogs. 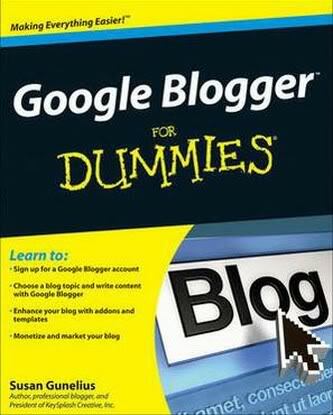 As I understand it, later on this month Google/Blogger will be charging a flat rate of ten dollars for every new blogpost - that's approximately £6.80 in British money. Each photograph you insert will cost a further five dollars and they are going to charge the same fee for any comments left on other blogs. Lord knows how they are going to police this but I understand that Google have secretly developed a huge computer facility in San Diego to act as a billing centre. I don't know about you but these unexpected fees are going to severely curtail my blogging activity. I just won't be able to afford it. You would think that Google already have enough money to buy up the entire Greek kingdom with all its islands so how come they're imposing these fees? It was all landed on us so unexpectedly and I think bloggers across the globe should immediately campaign against these measures. The internet should be free. If you have any ideas about what we can do please leave them in "Visitor Comments" below.